→Calphalon Tri Ply Copper Review – Should I Buy ? Tri Ply Copper Review.One of the most tried and tested materials to use in the kitchen is copper. It is simply timeless and elegant. Today there are many different variations of copper cookware to choose from, binding together old fashioned, durable cooking metals with new technology. The copper cookware set by Calpalon is one such set. With its brushed copper exterror and stainless steel interior you get a practical cookware set that looks stunning in any kitchen. Below we share our Calphalon Tri Ply Copper 10 Piece Set Review. This copper cookware set is constructed of a tri ply layer. An inner core of heavy gauge aluminium-is sandwiched between a layer of copper and 18/10 stainless steel. This combination of metals, a copper bottom and an inner aluminium core ensures excellent conductivity of the entire pot or pan. Food is cooked evenly, resulting in no hidden hot spots of food. It also cooks food thoroughly at lower temperatures. The brushed copper exterior complements any kitchen decor and is easy to keep clean and highly polished. The interior of this cookware set is made from non reactive and heavy duty stainless steel. What this means is that the cooking surface is highly polished and reflective, which is the cooking surface that many top chefs prefer to use. As it is made from stainless steel this also means that it will not react with food in any way, nor will not easily corrode or scratch. Food coming into contact with stainless steel is extremely safe and one of the most preferred cooking surfaces. The cookware set comes with a selection of four differently sized stainless steel lids. Each of these lids fits their corresponding pan securely. The tight seal ensures that all moisture and heat is kept locked in while cooking. Therefore there are no losses of nutrients and food cooks more quickly, therefore reducing the overall cooking time. Each lid has a stainless steel handle that will stay cool while sat on the cooker top. As with all of the pots and pans, the lids are easy to keep clean and can be simply wiped down or washed with hot soapy water. 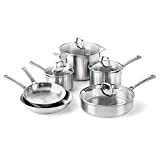 Each pot and pan within this set has a long stainless steel handle. Even though made of cast stainless steel they are incredibly light and ergonomically designed. They are easy to grip and comfortable to hold, and have been designed to be held for long periods without any discomfort. They have also been designed to stay cool to the touch when the pot or pan is placed onto a hot stove. The handles as well as being safe to hold are also sturdy and hard wearing. They feel extremely safe when holding a heavy pot or pan as they are double riveted for extra strength. Each pot and pan has been designed with a flared rim. 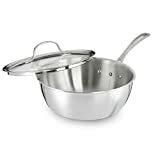 This makes each pot and pan that much more durable, and with little risk of spilling hot water or food onto yourself or onto a kitchen surface. The pans although incredibly sturdy and robust, are not too cumbersome or heavy to lift and to manipulate on the stove. This cookware is low maintenance as it is easily cleaned and is pretty much scratch resistant. It is advised that wooden utensils are used while cooking to help prevent scratches. Safe to use in oven and under broiler. Looks beautiful with brushed stainless interior and copper exterior. Tight fitting stainless steel lids. Flared rims make the pans extra safe as easy pour. Hard wearing and durable stainless steel interior. The cookware set is not dishwasher safe. Lids are stainless steel so unable to see food while cooking. Q. Is the cookware dishwasher safe? Q. Do you need to polish the copper? A. This is not a requirement although it can help to maintain its shine. The Calphalon Tri-Ply Copper 10 Piece Set is extremely good value for money. Comprised of an aluminium core and coated with stainless steel and copper, it is incredibly hard wearing and cooks food thoroughly. Although the set cannot be placed into the dishwasher, it is very easily cleaned with hot soapy water. Copper often has the image of being difficult to care for, but this is simply not true. By using wooden utensils and regularly polishing the brushed copper exterior, it will stay looking shiny and in good condition for many years.